It’s tough being both a parent and editor, reviewing your student’s college application essays. You’ve probably told them hundreds of times to start early so they have time to revise and edit. Too often, that advice goes in one ear and out the other of your typical teen. 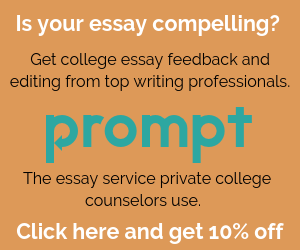 So if your student is cramming to finish up his or her essays, we thought you (and your student) could use advice from essay experts who review thousands of college essays each year. The experts at Prompt have 5 simple questions they recommend you use when reviewing your student’s essays. These are the same questions Prompt’s Essay Specialists answer for the thousands of college essays they review. They’ve helped students get into every top university and earn millions in scholarships. What did you learn about the student? The 1-2 sentence answer to this question is effectively what college admissions officers will walk away with understanding about your student. Ideally, that means understanding who your student is and how he or she thinks. Discussing the answer to this question with your student will generate a great conversation and help your student think through the message he or she is trying to convey to his or her readers. Colleges are looking for students who have “spikes” in different areas as they build out a well-rounded class. As such, a compelling essay covers the student’s interests and experiences that set him or her apart from other applicants. Prompt finds personal statements (e.g., the Common App Essay) are most impactful and compelling when they cover a student’s times of personal growth, passions, personality traits, and goals for the future. If your student has already written his or her personal statement essay, see if you and your student can identify most of these elements in his or her personal statement essay and across his or her application. If your student hasn’t started the personal statement essay, click here to have them use Prompt’s free tools to help develop compelling content. What didn’t I learn that I wanted to learn? Prompt often calls what you didn’t learn from reading the essay, the “unanswered questions.” These are the things that pop into a reader’s mind but are never answered in the essay. Unfortunately, the most critical questions often go unanswered. The three questions that go unanswered most frequently are (1) “What did your student do differently as a result of this experience? (2) How did this experience or interest shift your student’s view of herself or others? (3) How do these experiences relate to your student’s future goals? Is the essay well structured? What are the tactical next steps for improving the essay? Be clear about what your student needs to go and do. Sometimes this means overhauling the content or structure in a significant way. The key is to be clear and upfront with your student. Give these questions a whirl as you’re reviewing your student’s college application essay. This approach will help your student create a compelling essay and remove some of the pre-application deadline stress.